Previously we have articles on list of browsers & web browsers for mac from which we got few web browser those are best & faster web browser among 100 internet browser. A lot of web browser available online for free download but few of them are best web browser. From starting of internet, browser is one of the most important element of internet. In below list we included 7 internet browser which available for all platform (windows, mac, linux). This best & fastest web browser ranking is based upon combination of individual ranking of fastest web browser & best web browser. Below of this content we list individual ranking. Google Chrome developed by Google Inc. & available as freeware web browser. It is top most internet browser not only for windows but also for mac & linux. Its best in rendering web pages. Chrome render text of web page much faster than other browsers. Also it has most of features than others. Google Chrome also available for mobile platforms like iOS, Android etc. Download Google Chrome web browser from its official site https://www.google.com/intl/en/chrome/browser/. Mozilla Firefox is second most in the list of best & fastest web browser because it render media (like image & video) faster than other even Google Chrome. Also Firefox give advanced features for design & developer through its plugins. Mozilla Firefox is available to free download & open source software. Get free Mozilla Firefox latest web browser from here http://www.mozilla.org/en-US/firefox/new/. Safari is a web browser developed by Apple Inc. and it comes as default web browser for mac operating system PC, called MacBook, iMac, Mac etc. Also Safari comes with iOS in all Apple mobile devices like iPhone, iPad & iPod etc. It has speed nearly equal to Chrome & Firefox but only disadvantage is that it doesn’t have plugin & extension facility. Get idea and details about Safari web browser from here http://support.apple.com/kb/dl1531. Maxthon web browsers become more popular day by day, it also known as Maxthon Cloud Browser which is available as a freeware internet browser. It is developed by Maxthon Ltd, it almost support all type of operating systems like Windows, Mac, Windows Phone, iOS, Android etc. Get free maxthon web browser & read more from here http://www.maxthon.com. Most people know Opera as a web browser for its mobile version called Opera Mini. It supports almost all type of mobile device not only that but Opera has desktop version of internet browser for windows, linux, mac etc. You can get it for free, download from here http://www.opera.com. Sea Monkey is free & open source internet browser, also it is cross platform internet software package. It has great features like advanced email, IRC chat, HTML edit, news group etc. Sea Monkey based on Mozilla Layout Engine. Get your copy of Sea Monkey internet browser from here http://www.seamonkey-project.org. Internet Explorer is very old & popular web browser for windows. Most of the people in world using Windows OS but have preinstalled Internet Explorer. This is not so fast internet browser but it is decent & it got 7th position for its popularity only. It is developed by Microsoft Software Company. News is their Microsoft working on new web browser called Spartan which may replace IE. But IE become nice after 9/10 version update. Check out more stuffs related to Internet Explorer from here http://windows.microsoft.com/en-IN/internet-explorer/download-ie/. In below list, we sorted internet browsers as best web browser for its popularity in market. 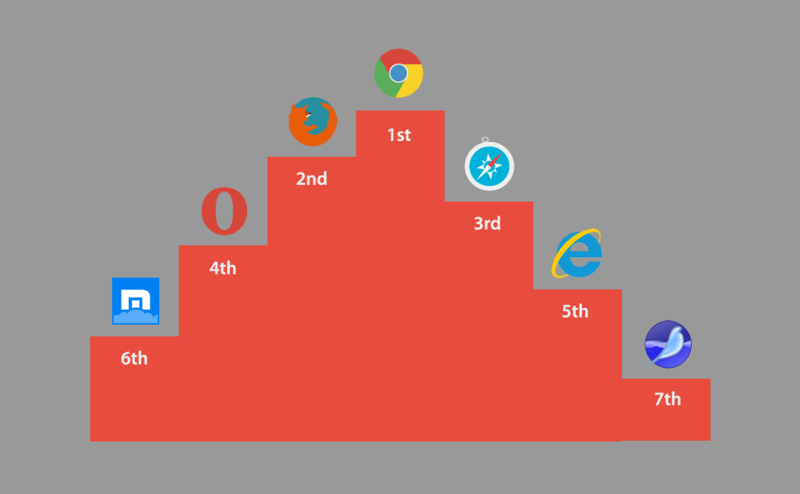 In this below list of browsers, browsers are sorted according to its speed & performance. So these are top 7 fastest web browser available in market for free download. In above content it shows all these are fabulous internet browser available for all type of platforms (Windows, Linux, Mac, iOS, Android, Windows Phone, BB). These best & fastest web browser may be installed on your PC, check out more stuffs related to it & comment below to us. Is Opera Free? Will it be hard to install? When I had google as a home page, I was satisfied. them. Google will NOT give me access to my email. I have had this email for years. It is NOT fair. My password was saved and permanently encoded. the net and one for my email. Easier said then done.